"He was as good a man as he had to be in a life that was hard and even.—Alfierri describing Eddie before the arrival of two immigrant cousins explodes feelings he's been in denial about and that ends up with him shouting "I want my respect" to the wife whose respect he's lost. I believe that the common man is as apt a subject for tragedy in its highest sense as kings were.— Arthur Miller in his 1949 essay "Tragedy and the Common Man." Occasionally an actor is credited for owning a role, but time and time again, along comes an actor to prove that great roles are forever open to new interpreters. The same is true for the director's vision for mounting a classic play for contemporary audiences. Phylicia Lloyd's second all female Shakespeare currently at St. Ann's Warehouse in Brooklyn is one case in point. The Belgian director Ivo Van Hove has focused his re-interpretations of twentieth century dramas, notably by the era's greats like Tennessee Williams and Eugene O'Neill; also by film world icon Ingmar Bergman. I've found Van Hove's method of stripping these works down to their implicit meanings and then staging that essential subtext intriguing, but also troublesome. His auteur-director style often seemed to be pushing aside the author's vision. 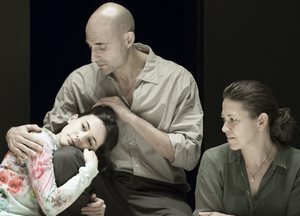 Van Hove's making his Broadway debut with A View From the Bridge which ranks high in Miller's oeuvre is certainly timely given that this is Miller's centennial year. However, coming just five years after one of the most memorably acted and staged of several productions I've seen, I admit I was a bit hesitant to embrace this new Vanhovized version. Several readers expressed similar reservations. If you're one of those who felt Liev Schreiber was the only Eddie Carbone you ever had to see, get ready for a brand-new and also exhilarating experience. This is Mr. Van Hove at his best. He isn't negating anyone's memories of the 2010 version or of the also outstanding 1998 Broadway revival. Nor is he deconstructing the play as written so that first-time viewers will get his rather than Arthur Miller's story. Instead he is following Miller's intent to prove that the common man has as much the makings of a tragic hero as the kings in ancient Greek and Shakespearian dramas. By stripping away scenery, period appropriate costumes as well as some characters, he's simply taken Miller's Brooklyn based tragedy several giant steps further — all the way into the classic Greek amphitheater format that leaves it up to the actors to ratchet up the intensity of relationships and to draw us into the unfolding drama. The stripped down physical production at the Lyceum affirms and extends Miller's affinity for Greek tragedies which he detailed in his essay "Tragedy and the Common Man." That essay was a plea to accept an ordinary character as a suitable tragic hero. The current production also makes Alfieri,whose presence was originally criticized by many as an unnecessary allusion to the Greeks, a completely appropriate and effective solo Greek chorus. Besides successfully removing the kitchen sink realism, Van Hove has directed a classy cast to make the Carbone family and other key characters come to vivid and believable life. Most of the actors from last year's London production are on board. New but excellent replacements are the actors playing the immigrant cousins — Michael Zegen as the married and volatile Marco and Russell Tovey as the unmarried and full of life Rudolpho; also an immigration officer (Thomas Michael Hammond) who single-handedly represents fate's uncompromising furies. Mark Strong's Eddie is the magnetic centerpiece, a good man but an emotional illiterate unable to sense the connection between his fear about waning virility and the lust for his niece. The double kiss scene remains a highlight of his confused, angry behavior and will have you wishing he would listen to Alfieri (a superb Michael Gould) before destroying himself. Nicola Walker captures the pain of the more clear-eyed wife desperately trying to save her marriage and remain loyal to her husband though she understands what's going on. Phoebe Fox plays young Catherine with an unbridled, naive buoyancy that leaves no doubt about how she affects her middle-aged uncle. Given a less sexually charged situation, her youth and inexperience would make uncle Eddie's objection to her instant love affair and planned marriage to Rudolpho reasonable; in fact, under different circumstances Bea too might be less likely to endorse such an early marriage. Though bare bones in terms of props and costumes, this View. . . is a visually and aurally elegant production. Long time Van Hove collaborator Jan Versweyfeld has constructed a square playing area bordered by a clear wall just high enough to serve as a bench on which characters can sit. There's also a dark upstage wall with a door for them to enter and exit as needed. The feeling of this scenic design as a boxing ring is enhanced by the addition of padded spectator benches on either side of the stage which makes some 150 audience members compensate for the missing Carbone neighbors — a second chorus of silent spectators. The opening scene in which Alfieri's first monologues is delivered as Eddie and his fellow dock worker Louis (Richard Hansell) are washing up after a day's labor is a stunner. But even more breathtaking is the bloody finale that's operatic enough make you understand why the play actually yielded an opera (by William Bolcom and with a libretto by Arthur Miller). The structure of the play is intensified by Tom Gibbons's underscoring of the story with the brooding music of "Fauré's Requiem" and ominous drum beats prepare us for the inevitability of the ending. Despite cuts that include getting rid of the foreshadowing Chekhovian knife with which Miller had Eddie peel an apple, Van Hove was smart enough to allow for two metaphorically potent, prop-dependent scenes. Thus, gone is the intermission, but not the chair lifting contest between Marco and Eddie that originally ended the first act. It remains to telegraph the Italian's power to protect his brother against Eddie. An even smaller prop, a cigar lit by Catherine for her uncle, was also clearly a too deliciously Freudian touch to abandon. If I had to give a grade to this review, I'd be tempted to go with 5 stars or whatever the top grade of the ranking system. However, there are a few reasons to take off a star or a + from an A. Except for Mr. Strong, some of Brits efforts to get the Brooklyn-Italian accents right makes them less than perfectly clear to understand. And, though shorter at two hours than traditional versions, there are a few spots between the breathtaking opening and finale that feel a bit slow without more realistic details about the neighborhood and the community that shaped Eddie. Besides the sometimes inconsistent and hard to understand accents, I found the actors being barefoot a bit pretentious and too much of an envelope push. Still, this is a highly theatrical, not to be missed tribute to the play's durability and adaptability to new staging concepts. For more about Arthur Miller and links to other Views. . . reviewed at curtain up, see Arthur Miller Still a Newsmaker In the Centennial Year of His Birth . From 10/21/15; opening 11/12/15, closing 2/21/16.